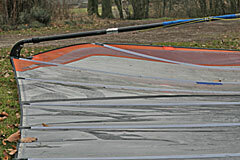 Profile stability in windsurfing race sail, DIY. 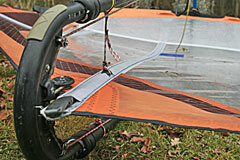 DIY "flaps-up" - a possible modification of your race sail. Back in March 2002 I asked Barry Spanier on the Gaastra forum, about a peculiarity we had experienced at my local spot with some of the first Gaastra Nitro sails (see the question here). To make it short we had noticed that because of an asymmetry inherent in the sails they had a lot of low end pull/quickly overpowering instability on one tack, while they had a lot of draft stability/speed on the other tack. The profile on this last tack was one of a pretty forward profile, that was locked in place by the battens swinging to leeward for the last distance towards the leech. Of course - the question to Barry was, if he could manage (or if he found it preferable) to build a race sail that had this S-shape on both tacks. I can't find Barrys answer anywhere on the web - but I clearly recall him using the words "flaps-up or flaps-down" - probably meaning that you can't have the best from both worlds. And for his subsequent race sail series I think that his effort in this respect has been to make his sails as "neutral" as possible (today the battens on his race sails are placed alternately on either side along the leeches). But those Nitros really were something special - if you kept sailing in one direction! 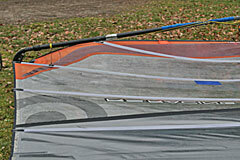 Now Niel Pryde apparently has come up with a way to create a kind of S-shape for their EVO II race sails, that shall function on both tacks. In their usual PR-slang they call it "Dynamic Compact Clew", and what is new compared to the old (2007) Racing series with their cut outs, is, that now Neil Pryde not only talk about the (imaginary?) 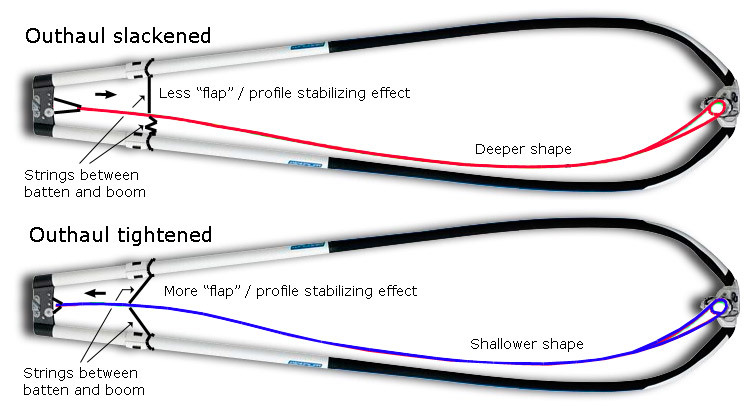 effect of a shorter boom (lesser swing weight etc.). Now the even further forward placed clew is meant to have a serious effect on the performance of the sail, and if that's true then we're talking about quite another ballgame than the cut out clew, that was introduced in 2007 - and that (some) other sail brands have subsequently imitated in spite it's character of a gimmick (in my view). Click the illustration to enlarge. Compared to the first generation of Nitros, which has the S-shape in all battens, the Neil Pryde DCC in principle only induces the S-shape in one batten. However, as this batten is kind of the main batten - placed centrally in the sail - it should presumably have at least some effect on the battens closest above it. From my experience with the old Nitro Sails I think there's a good chance that the EVO II's perform as described. And in the German "surf" magazine (03/2009) the testers have confirmed the claimed performance, which is also implied in the last words in the article: "Wir sind schon gespannt, wie die Konkurrenz dagegen hält." Does this mean that if you want the same kind of performance, you either have to buy the new EVO II's, or you alternatively have to wait until next year for the competitors to come up with something as efficient? Well, if so then that's bad news for those of us, who are fed up with the much too fragile Neil Pryde race gear, and who perhaps also are fed up with the pretty arrogant corporate culture of the company (the market mechanism works in several ways ...!) - and that perhaps don't have the patience to wait for other companies to catch up. 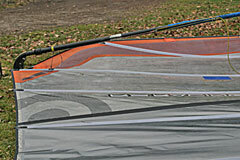 Most new race sails have a kind of cross batten in the boom area - meaning that it goes from under the boom cut-out at the luff to just over the clew at the leech. This design most often means that the boom is closest to this "cross batten" near the leech - and we can take advantage of this fact if we want to make a connection between a solid part of the sail (the cross batten) and the boom close to the leech. In other words - if we place a couple of strings from the batten to the boom a little from the leech (or clew), it might be possible to induce the batten with the desired S-shape. And at least theoretically it might be possible to place the fixation points of the strings in such a way that the S-shape of the sail is dependant on the amount of outhaul. Hopefully the rough outline below serves to illustrate this better than words could. 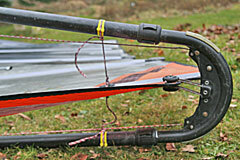 Where to place the strings on the boom relative to the batten? You'll probably have to decide on whether you want the most S-profile effect when the sail is fully outhauled or when the outhaul is loose (or somewhere in between). My spontaneous preference is the first option, and that's the one shown above (you can see the other extreme here). Where to place the strings on the batten? If you try to estimate the relative measures boom length/clew distance from leech of the EVO II from available pictures, you'll probably find, that the "Dynamic Compact Clew" is placed around 10-12% from the leech (estimation illustrated here). Admittedly, this is probably pretty inaccurate, and the figures are furthermore a little dependant on how much the sails illustrated are outhauled. How to fixate the strings on the batten? I'm sure there are lots of elaborate ways to fixate a couple of strings to a batten - but at this preliminary state I think that a couple of holes in the batten pocket would allow the strings to get hold of the batten (for instance by tying a single fishing knot - or perhaps by using a heavy duty strip). And the holes in the batten pocket can easily be done by means of a soldering iron. It shall be emphasized, that I haven't tried this pretty simple "flaps-up with strings" thing on the water yet - but half an hour of rigging and fiddling with strings ashore didn't reveal any obvious weaknesses. At a later state it's of course possible to elaborate on this string thing (even to make them adjustable on the fly). Below you'll find a couple of pictures from this session (with a 2007 NP Racing 10.7 that are soon to be replaced with a race sail from another brand). Click the pictures to enlarge. Before putting on the strings (little outhaul). Click the picture to enlarge. Effect of the strings (little outhaul). Effect of the strings (much outhaul). Placement of the strings (little outhaul). How does this rather primitive "string system" compare to the NP Dynamic Compact Clew? Well, I've seen Robert Stroj cited for the statement, that the DCC has allowed him to put more tension in the lower part of the leech, and he also claims that the DCC works best if the last 40-50 cm of the batten towards the leech is made a little softer to avoid the S-shape effect to be put too much forward in the sail. Perhaps more importantly: The NP DCC seem to be kind of self-adjusting, and more outhaul primarily seems have an effect on the shape of the front part of the sail. Compared to this the "string system" should seem to react more aggressively to outhaul in the sense, that the S-shape seem to be more influenced by outhaul than in the DCC way. 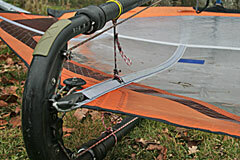 Or put in another way - the DCC should primarily react to the strength of the wind, while the string method ALSO reacts to outhaul trimming. In theory you might imagine that the DCC would rotate a little harder than sails with a more conservatively placed clew (de facto shorter "active" batten to take up the deformation), and in this respect the string method should probably not hinder the rotation a lot. One last minor point: If you belong to the people, who think that the boom contraction effect under stress might be a problem, it's pretty easy to imagine that the flaps-up strings shall have a little counteracting effect. But please remember - this still has to be tried in the real world. After deadline: A few comments on the first test.